The truth is, I am still a green grass at the investing field. I have started (virtually) with RM250K of capital and within 2 months I had Lost RM100K. I do not know how much further am I going to lose if I venture further into investing in stock market. I vividly remembered that previously an ex-remiser which happens to be a friend of mine told me that Malaysian capital market is not about how much you are gaining but actually about how much you are willing to lose. Frankly, I have no significant background on stocks, investing bla.. bla.. blah.. at all. But there is something inside me which is having an indefinite love to watch figures and charts. Then there is this 'Bursa Pursuit'. 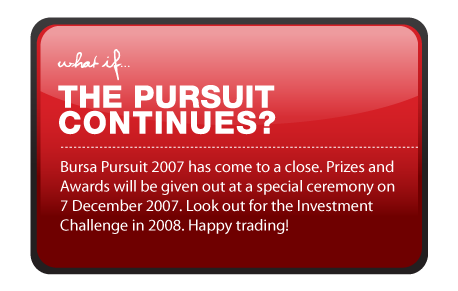 A virtual investment game designed by 'Bursa Malaysia' came across the community. It began last October. The game is about to gain as much profit as you can after being granted (virtual) money amounting to RM250K. In relation to that they had also created an environment that mimics the real stock market for the investor to trade. All the codes, the stock's names, the price and the charting is almost as real as at the outside market. They also feature out the announcement of companies, corporate exercises, warrants, Indices and everything. The best thing amongst all is the personal game portfolio where you could watch your perfomance as you invest through the game. Participants of the game can buy or sell, calculate the profits or loss and also see the actual trading history. Be remembered that the game also 'charges' fees as per real web brokerage of which is at 0.42% for every transaction made. The game was designed for those who do not have any background on stock investing like me . The risks are real, but the cost is Zero. It did serves its purpose which are to educate and to expose younglings like me to the Malaysian capital market. For that, I tagged along and played for almost about 2 months of market days until it closes for good today for the year 2007. It was fun but of course it is a little bit of 'cursings and swearings' as I do not even have a tiniest clue of what I am doing. I was eager and too keen. I had became impatient. I do not do my homework. Furthermore the pressure 'bullish' after I had to compete against myself and my friends. I had no game plan. Later I found out that I am losing my capital instead of gaining to any profit. That indiscipline investment had made me losing control. It adds more after I followed a tip from a friend to invest into China's Structured Warrants. The moment it marched into the game, everybody was buying. As usual most of the amateur investors fail to calculate the risks. Therefore, everybody was losing including me. It was a sad moments the losses are irrevoccable and unalterable. The point is, the game had really teaches me something. Investing directly in stock market is not just for a fun nor it is a playing matter. It is a game which tests your discipline and serenity. It also teaches me to be greatful of what you are having and protecting it from falling into ailing apprehension. Any decision made means that you are making, even to the smallest transaction, a step further to the double-edged risks. It does not matter ether you gain or loss. It has been decided. Nobody could change it. So be it. Moreover, investing teaches me not to become an avarice. Avariciousness will always lead to greater loss. It has it's "gripping" effect and "married" effect. Meaning that. Once you lock in a buy or sell, matched features will leave you either gaining profit from it or put you through a losing streak. A "stop-loss" is a merely a tool to prevent you from falling into greater disaster. If your are hoping to re-gain after the losses, in the moment, amateurs will find themselves bounded to "hopeless". In due time you will give up and then surrender to your losses forever. Personally I say that I am going to miss the intense feeling when I watched the fluctuating prices and volumes, booking profits and stop-lossing. I am sure to participate again next year with more confidents and pride. Next is a target to become a winner. For you...whatever.. and get a life..
Im in short of something. Certain human beings do not realize that they are committing mistakes and wrongdoings all the time. Even the most meticulous human on earth will suffer to this disease. The thing is, the said pain do not physically protrude as a broken bone coming out of your elbow. But the pain is still there. Human are borned in a way that they will always look for perfection. A nature that was carefully selected and bestowed upon us by the Almighty Allah. In relation to that, human will always scavenge for perfection until he finds it. To a human, once the satisfaction quota has been achieved, the exploration will cease and he/she will further the chase into another sector. In order to get the gauge filled, Allah had created another factor. This factor is called "check-and -balance". The accounted novelty is put inside another human just to mirror the explorers. It will tell either they are in the right track or had swerved to the path of destruction. Then, if I were to be in front of a mirror and to found myself blundered to the deteriorated and crumbled way, I will quickly adhered to the rule and pull myself to the correct footsteps again. But then again, there are those who hate it so much to be corrected. These Hard-headed bozos always perceive things their own way. If a mishap should happen, they quickly point their point-finger to others and start to exclude themselves from the misdemeanor. NO such thing as a "Check-and-balance". Criticism is the 8th deadly sin and not a single item to replace it for the 8th virtue.Next thing is they will always put their feet forward and starts to waive their correctized clubs to all people. They are the utmost, unmitigated truth in the whole creation. That is what they claim. What makes them think that way? Under their divine chapter of "seniority", humility is a non-existence. Those who evolutionize to the taste of "salt" will never admit that the salt is "masin". This proverb shall be foreign to non-Malaysian as it was derived from Malay proverb "...lebih dulu makan garam.." (earlier generation have greater wisdom than newer generation). Well, in term of wisdom yes the "salt" is "salty", but they tend to forget that salty is only for those who have the correct taste bud to taste it. What I am trying to say is that, globalization will not going to adhere to the rules. Even the Chief Secretary of Malaysia also had stressed that Seniority has nothing to do with your ability and wisdom. Those who excel in their own field will be at a higher post. Not to forget that a principt that I shall never forget which was told by my forefathers "menunduk bukan bererti kalah, meninggi bukan bererti sombong." If this principle is applied to all human. Then the world is perfect and a perfect place to live.